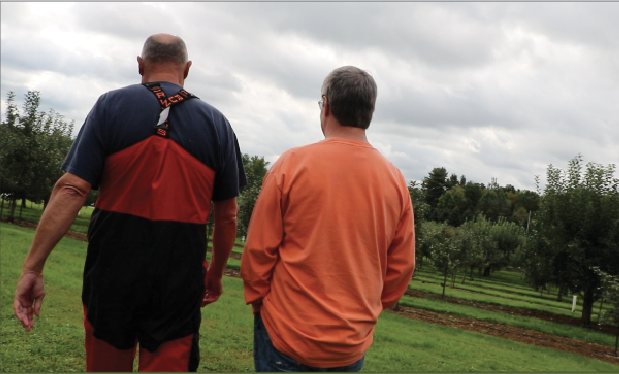 Jeff Davenport and Jeff Boswell walk through the orchard at Davenport Fruit Farm Cidery and Winery on Saturday, Sept. 29, 2018. On 14 acres of gentle, rolling earth, just over three miles from Allegheny College, sits Davenport Fruit Farm Cidery and Winery. 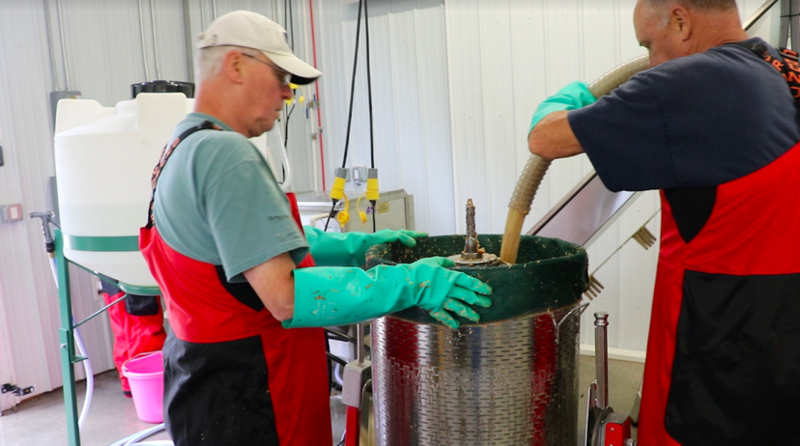 Jack Boss and Jeff Davenport press cider in the production room of the farm’s cider barn on Sept. 29, 2018. The farm is situated along the eastern edge of Townline Road, with Hobbs Road lining the northern section of the property, and Shartle Road, lining the southern section. More than 1300 trees — apple and pear — define the orchard, along with three ponds, the former Davenport homestead and a cider barn. “These are Red Fujis, and you must have one,” Jeff Davenport said as he picked two apples from a tree at the Davenport farm. He handed one to me, and one to my colleague, Brian Hill. Davenport picked another for himself as Jeff Boswell, current owner of Davenport Fruit Farm, picked one as well. Stepping back from Davenport and Boswell, Brian snapped a photograph of Jeff and Jeff standing side by side. The Davenport family owned the farm for 107 years, from 1910 until August 2017, when Jeff Davenport sold the farm to Boswell. “Jeff (Boswell) is now taking it into a whole new generation of cider and wine and all the things he loves to do, and I’m just assisting as long as he wants me to be around, until they get the whole orchard business understood,” Davenport said. 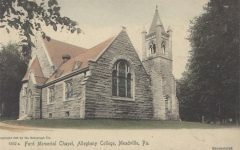 Both Davenport and Boswell grew up in the area and met about 10 years ago as members of the Benevolent and Protective Order of Elks Lodge 219, previously located north of Meadville on Route 86. The two men recalled being at the lodge on its last open day in summer 2017 before it relocated to Baldwin Street in March. “I was walking out the door, and I turned around and said ‘Hey Jeff, by the way the farm’s for sale,’ and he said, ‘What?’ And that’s how it all happened,” Davenport said. Walking through the main doors of the cider barn, visitors can be greeted by volunteers who help with sales, or Rosie Holeva, the farm’s manager, who handles sales of merchandise and alcohol, ordering and coordinating events — which include weddings and parties at the farm. Boswell, a hobby cider and wine maker, is ready to bring his skills to the Davenport business, and construction is underway at the cider barn to add restrooms and a tasting bar and to update the cooler and loft space in the center of the barn, just beyond the barn’s main entrance. This center room and loft will soon house tables, benches and occasional musical groups, Boswell said. The Alcohol and Tobacco Tax and Trade Bureau has granted Davenport Fruit Farm a limited winery license already, Boswell said, and once construction is complete, the Pennsylvania Liquor Control Board will be able to perform a final walk through and inspect for PLCB compliance. The center tap room will feature a 12-tap system for Davenport hard ciders and TimberCreek Tap and Table beers. Boswell said the farm has partnered with TimberCreek and will use its bottling facility in Grove City, Pennsylvania to bottle Davenport hard ciders. TimberCreek products will be sold at Davenport, and Davenport products will then be sold at TimberCreek, he explained. Boswell said he hopes construction is completed by the end of October. “You have to have big dreams,” he said. Because the construction process has taken longer than anticipated, Holeva said she thinks the projects will more realistically be completed by early November. During this transition period, the farm is still operational, selling apples at the farm and the Market House in downtown Meadville on fall Saturday mornings and pressing its traditional unpasteurized cider by the gallon. Selling unpasteurized cider, which is not exposed to high heat to kill certain microorganisms, requires a license, and Davenport facilities are inspected for cleanliness to maintain that license, Boswell said. The farm’s apple inventory includes Honey Crisp, McIntosh, Northern Spy, Cortland, Idared and Red Fuji, as well as Red Bartlett Pears. Honey Crisp, McIntosh and Fuji are all good for baking and eating, according to Boswell, who said he tends to favor the Northern Spy and Bartlett Pears for use in hard ciders. Holeva noted the Honey Crisp as the farm’s best-selling variety. The success of any variety depends on an area’s climate and the weather patterns in that climate from year to year, and according to Davenport, Meadville does not offer ideal growing conditions. The farm’s focus is not on pest management with pesticides, Davenport said, but on the use of spray fungicides to manage different fungus types. Davenport and Boswell work closely with Pennsylvania State University plant pathology labs, providing the labs with bushels of blighted apples. The University then assists the farm with its spray schedules and makes modification recommendations for spray chemicals. 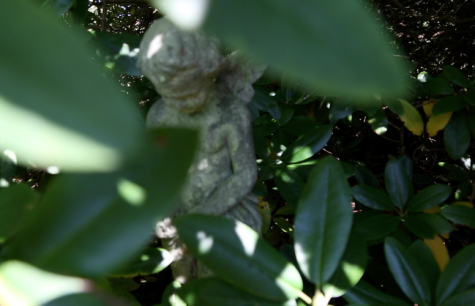 A small group of five trees in this area, according to Davenport, may be able to produce successful crops with vinegar or other household spray remedies, but spraying is essential for larger orchards in Pennsylvania, he said. “As much as we would like to be a little bit more on the organic side, you just can’t do it with this many trees in our climate,” Davenport said. This year, for instance, Boswell estimated the loss of 40 percent of the farm’s crop due to an exceptionally wet April and May, which are the two most important months in the apple growing season, Davenport said. Heavy rains wash away fungicide spray, Davenport said, and the trees are more susceptible to fungal infection and spread. But the area also experiences dry spells, like that of the 2017 season, Davenport said, and during periods of dryer weather, the farm’s drip irrigation system becomes essential. While the farm did not irrigate much during the 2018 spring season due to natural wetness, irrigation made a big difference for the 2017 crop. The farm’s irrigation lines source water from the three man-made ponds on the property, Boswell explained. “I told myself I never wanted to be a farmer because you’re so reliant on mother nature, but here I am,” Boswell joked. As the farm collaborates with Penn State labs to further characterize state fungi affecting apples, it also celebrates a continued relationship with Allegheny. Parkhurst Dining Services purchases Davenport apples and cider for use at Brooks Dining Hall, at catered events and for sale at McKinley’s Food Court, said Lori Chiodo, director of retail dining for Parkhurst. Executive Chef for Parkhurst at Allegheny, Charles Wise, said the college and Parkhurst have grown increasingly more farm-to-table, sourcing products from a growing number of local and regional places in recent years. Wise, who began work at Allegheny almost seven years ago, said Parkhurst started purchasing apples from Davenport about a year after he arrived. Part of Parkhurst’s Culinary Gold Standards, Wise said, involve a commitment to local and regional producers. “The Gold Standards are getting better as we speak, but we use all fresh products, all fresh produce, fresh chicken, there aren’t any frozen products, we hand-bread fish and chicken, that kind of thing,” Wise said. Gold Standards also require the availability of five different types of fruits, Chiodo said, so during Davenport’s peak season in the fall, as well as its off season, Parkhurst sources apples from other producers. Jason Snavley, executive sous chef for Parkhurst, said apples and other produce are sourced from Paragon Foods which has several market sources and is based in Pittsburgh. Davenport apples are typically more expensive than other apples, but they have other, non-monetary values, according to Snavley. Snavley said Parkhurst has been going through a lot of apples in the last few weeks, and Davenport estimated the college goes through 12 bushels of apples a week during peak apple season. To assist Davenport Fruit Farm during harvesting, Allegheny students have volunteered to pick apples for the last 15 years or so, Davenport said. For several years, Edible Allegheny Campus, a student club founded in 1994, has coordinated student apple-picking at Davenport. 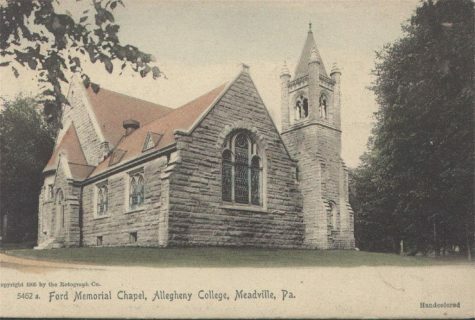 Due to a lack of representation for Edible Allegheny this year, president of I Heart Meadville, Merryn Spence, ’19, has pledged to continue the apple-picking tradition. Spence, who has been visiting Davenport Fruit Farm to pick apples every year since she arrived at Allegheny in 2015, said apple picking at Davenport has become especially important to her. “I was kind of nervous my first semester, and when I got to know people who cared about something as simple as picking apples, I thought that was super cool, and the relationships that the older students had with the family I thought was really commendable,” Spence said. Spence plans to send email sign-ups for apple picking at the end of October through the I Heart Meadville account and potentially in collaboration with Students for Environmental Action. As I walked through the main entrance of the cider barn on a Saturday in late September, the entry room was quiet, with tables of apples lining the walls. Apples were labeled for sale by the peck, which is two dry gallons, and by the bushel, which is four pecks. Holeva and Murray Braden, longtime Davenport volunteer, offered samples of hard cider to visitors and cashed people out after they browsed the apple tables. Braden is one of several volunteers who are called upon on an as-needed basis to help around the farm. She said the farm and the Davenport family will always be special to her, and she is glad to know the farm will continue with Boswell. “A lot of heart and soul and love goes into this place,” Braden said. Soon, the quiet was broken by noise flowing from the back production room, through the center tap room and into the main entry. Davenport, Boswell, Ken Holeva and Jack Boss were hard at work pressing cider into gallon jugs. Davenport said they do not usually press on Saturdays, but cider sales were high that week, and they would have run out that day had they not pressed more. The smell of fresh apples pervaded the cool air in the production room as whole apples traveled across a conveyer belt and elevator, were washed, cut and pressed into cider. Remaining apple refuse was piled into a wagon to be used as fodder for local livestock before it would naturally ferment. Parked just inside the production room through a wide garage opening, the wagon was greeted with clouded rays of sun as morning turned to afternoon. When the noise broke and some quiet fell again, teams of geese cackled as they flew over thousands of sleeping apples, waiting to be picked. Beautiful story. I read it eating a Davenport Northern Spy. Altogether delicious.